Come out December 7th for the Fireside Soirée! Warm your cockles at Telluride’s cozy The Bob (formerly The Black Box Theater), and enjoy a night of mind-bending stunts, comedy, live acts & libations! This VIP ticket is for a seat at a table for four and a special gift from us! 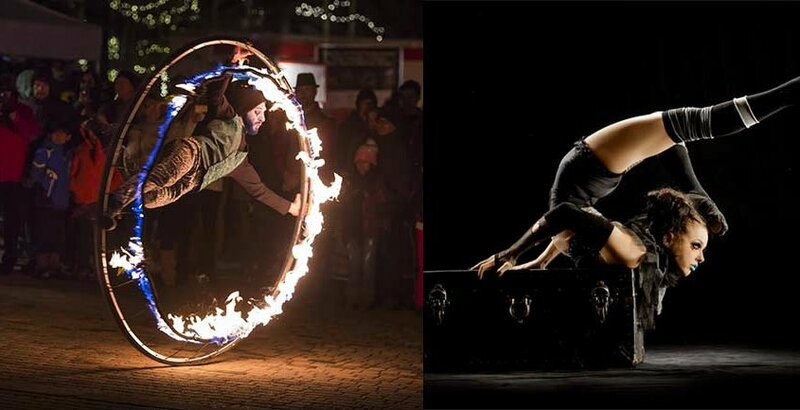 Rikki Morehouse is a movement artist specializing in contortion, hand balancing, aerial hoop, clowning, and fire, as well as a passionate and dedicated performer, teacher, and designer of things. Before relocating to Paonia, CO to embark on her new endeavor, Homestead Circus Productions, she helped co-found SacCirque, a Sacramento based collective of circus and flow artists. Read more here. Dominic Del Signore is co-founder of Homestead Circus Productions based out of Paonia, Colorado. He is a Roué Cyr artist, juggler, clown, and object manipulator with a flare for fire. Gathering experience from all over the world, Dominic performs and entertains while sharing his skill and knowledge as part-time coach.